Yesterday in Austin we had rolling blackouts, which sound kind of fun but aren’t unless you count having your electricity turned off at random as “fun”. The city’s blackouts were estimated to be up to 1 hour each, while my electric co-op’s blackouts were supposed to be only 10 minutes. Hooray for that, but still — to be safe I needed a recipe that would hold up even if the oven randomly shut off. With a bake time of only 10 seconds, this recipe from Shirley Corriher’s book Bakewise was perfect. These super-cheesy crackers are similar to those made by a gourmet store in North Carolina called “Rooster’s”. 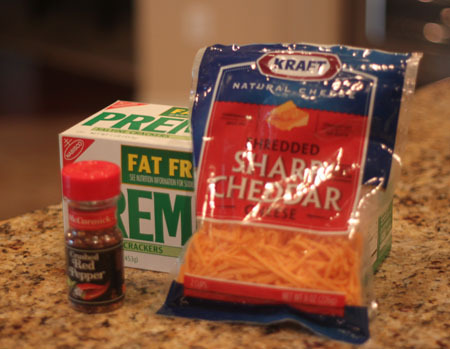 They’re peppery, cheesy, crisp and call for only 3 ingredients – fat free saltines, red pepper flakes and some good quality extra sharp cheddar cheese. They’re also our new favorite snack food. Fuzz had a whole plate of these for her after school snack and wanted more, and I had a hard time controlling myself around them as well. Anyhow, the recipe seems incredibly simplistic, but the magic is in the baking method. You cover the crackers with an even layer of cheese, bake at a high heat for 10 seconds, then let the crackers dry out in the oven for 2 hours. The fat from the cheese melts into the crackers making them crisp and flaky, while the cheese flavor intensifies as it dries out and becomes crunchy. Timing and using the right equipment is crucial, so before you use up all that good cheese, you might want to do a test run with a small batch. I started by baking mine in an 8 inch pan topped with about 3 1/2 oz of cheese, but you could also do a test run in a loaf pan. Notice I did everything wrong the first time. I used foil (which is shiny) and shredded cheese instead of grated. The shredded cheese wasn’t problematic, and while my first batch was slightly overcooked, I think that might have been due in part to my oven rather than the foil. Still, Shirley recommends using a dull grey or brown pan. I made two batches (both with foil) and found the perfect temp for my oven was actually 450 F.
These were such a hit I feel like going to Costco today, buying tons of cheese and playing with the flavors. Fuzz and I both liked the version where we added a little smoked paprika, but I think it might be fun to incorporate pizza seasoning or pepitas or maybe stick a pecan in the center of each cracker. 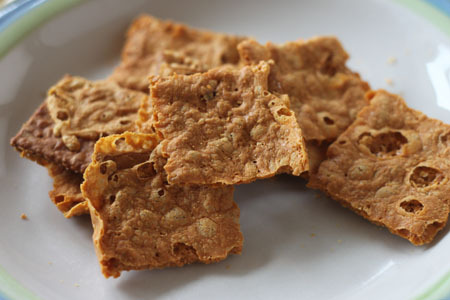 I also want to try with white cheddar, since I saw another version of the crackers made that way. One more note. I think this was the first time in my life buying “Fat Free Saltines” as up until now I only had a vague notion of their existence. I suppose fat free is important in this case because they absorb the fat from the cheese better? Rooster's Famous Fire Crackers are Saltines topped with cheese, baked for 10 seconds, then left in the oven for two hours. Arrange a rack in the center and preheat oven to 475ºF. (Updated -- I recommend 425 degrees F). Spray a 10x15-inch jelly-roll pan (not shiny – Shirley recommends non-stick heavy brown or grey) with nonstick cooking spray, and arrange crackers (about 40) in rows so that crackers are touching each other. I don’t see why you couldn’t line the pan with parchment rather than use the cooking spray. I actually used buttered foil, but Shirley warns against shiny pans. (Updated) I always use parchment. Sprinkle seasoning over crackers (if using), then sprinkle with pepper flakes. Shirley recommends about 5 flakes per cracker. Top evenly with the cheese. Bake for exactly 10 seconds and then turn the oven off. Leave in the oven for (at least) 2 hours with the door closed. 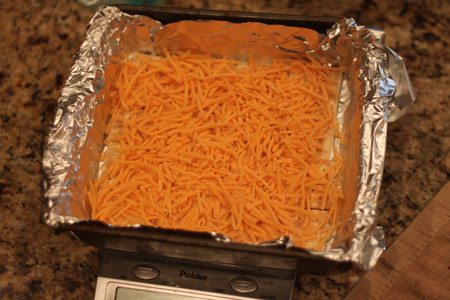 The hot oven melts and browns the cheese, producing an even coating of crisp brown cheese. The fat from the cheese soaks into the crackers and puffs them slightly. The cheese should be kind of a dark, brownish-orange. If it’s completely brown, the crackers are probably burnt. I first baked these in a shiny foil lined pan at 475 and while they were tasty, they were a little over-done. I did the second batch using more foil but with a heat of 450 and had better results. Shirley says that you may need to experiment with baking temps since not all ovens run the same. The cheese should be light to medium brown but not burned. Update: As mentioned above, 425 works for me, but test in your own oven. They keep well (if you can stop eating them) for several weeks sealed in an airtight container. I made two pans of these today; one with Old Bay seasoning,and one with Rick Bayless’ Frontera Grill chipoltle seasoning, both with sharp cheddar cheese. They came out GREAT. They were so easy, that I’ll definitely be making them again. Anyhow, I really had my doubts but these are surprisingly tasty~and oh so easy. I’m sure with all the oil (at least it’s unsaturated) they aren’t very healthy, but a truly easy snack for a summer BBQ. BTW, forgetting them and leaving them in the oven overnight actually worked out! I think if it had been humid out (rather than the dry heat we have from running the furnace) they might not have, though. These sound yummy and it’s perfect timing for superbowl! I’m going to make a batch and bring it to the party! Thanks for the recipe! I made these last night. But crap! guess where they are right now? I totally forgot about them after I turned the oven off! Hopefully they’ll be okay when I get home from work this afternoon. I bet these would be great mixed with some spicy Texas chili. 10 seconds? That’s awesome, and these sound great, never heard of them either! I’ve heard of these but haven’t tried them yet. I”m going to include them in my copycat club round up on the 7th k? Thanks!!! These are intriguing. I guess they are like homemade cheez-its. Thanks for sharing the recipe. This sounds like a good recipe for my college age son and his roommates! My North Carolina cousins make these all the time. The one time I tried to do it, they caught fire in the oven. Oops! They sure are good though. I actually prefer fat-free saltines as I find them much more crunchy and as a bonus, they don’t become rancid quiet as fast as regular. I’ve been eating them for years. Brand wise, I buy Nabisco. I just bought a Costco size bag of mozzarella-wonder how that would be? oh that sounds so good! so addicting! very interesting – I will have to pick up some fat free saltines and cheese the next time I go to the store. I would love these! Mrsblock — I’d never heard of them either. Susan, she recommends Zesta Fat Free but I just used Nabisco. Those sound great – making them today, assuming I can find fat free saltines (I have never seen them before). I’ve never heard of these crackers. They sound delicious!